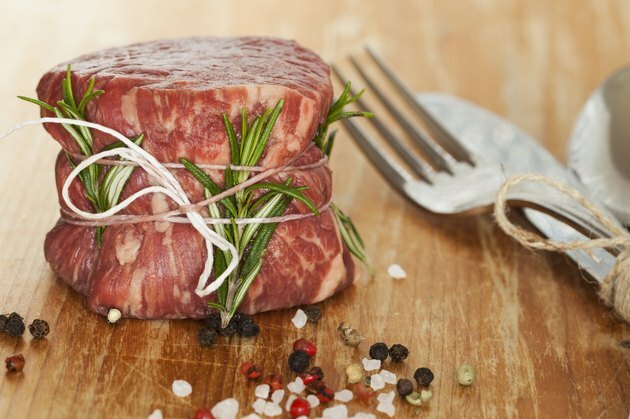 Filet mignon, which is French for “dainty fillet,” is cut from the tenderloin of the cow and widely considered the leanest and most tender cut of beef available. While there are a variety of methods of cooking these tasty treats, one particularly common method is preparing them in a grill pan. When properly cooked, filet mignon steaks provide a filling, nutritious and high-protein dinner. Brush or drizzle a grill pan with a light coating of olive oil, which will keep the filet mignon from sticking to the pan. Set the stove top to high and heat the grill pan for approximately two minutes. Sprinkle black pepper onto a plate. Coat each side of the filets, adding salt to taste. Less pepper is an option for aged beef, as the flavor is already fairly strong. Wrap the outer edges of the filets in strips of bacon. Filet mignon is typically lean, and bacon strips will help the meat retain its natural juices. Secure the bacon onto the fillets’ edges with water-soaked toothpicks. Place the steaks onto the heated grill pan. Sear the filets for two to four minutes, which will cook the filet to medium rare and retain taste and tenderness. To test the doneness, press on them with a clean fingertip. A filet cooked rare will leave an indention, a medium to medium-rare steak will give slightly but leave no imprint and a steak that is well done will be hard and solid. Remove the steaks from the grill pan, using tongs. Allow them to sit for two minutes, which will give the flavors time to settle into the beef. Serve with your choice of garnishes and sides. For extra flavor, coat the filets in a marinade before cooking. To prepare the marinade, mix 2 tablespoons olive oil with 1 tablespoon vinegar. Soak both sides of the filet in the solution at room temperature for 30 minutes apiece. Use oven mitts when handling a grill pan on high heat to avoid injury. Cook beef to an internal temperature of 145 degrees Fahrenheit to prevent foodborne illness, advises the U.S. Department of Agriculture.